This week's bargain is this chiffon blouse from H&M. It costs £14.99, comes in black, white, spotty, or grey-blue and comes in sizes 8 to 20. I got one in black and it arrived today. 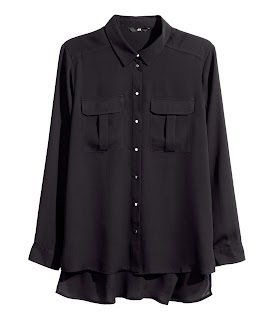 It looks good - a very cheap alternative to the ever popular Equipment blouse, and, unusually for H&M, is true to size. It hangs really well, possibly because of the small metal buttons. I like mine so much I think I'll get the grey-blue one as well.